By Harry Babad, © Copyright 2010, All right Reserved. The materials I share in the articles that follow come from the various weekly science and environmental newsletters to which I subscribe. However, as a fallen chemist I still subscribe to Chemical & Engineering News. A magazine published by the American Chemical Society. I’ve been a member of that organization for over 50 year, despite having switched my attention to the safe disposal of high-level (the hot stuff) nuclear wastes including both those generated in the defense of our country and from the generation of nuclear electricity. So I decided to see what I could glean fro the last half-inch or so of back issues, that might interest our readers. Chemistry is related to, by less than three degrees of separation, to most aspects of our lives from energy we use, to the production food and safety, medicine to extend our lives, and is a critical part of all the widgets and do-dads that make up our technology toys. So, enough blabbering, here’s the best what I found. Fuel From The Sun — Water + sunlight = fuel. The Gambler — My degree says I’m a doctor, would you let me perform open-heart surgery on you? As always my tid-bits are only a partial look at the original article, click on through if you want more details, as well as <often> other references on the same topic(s). 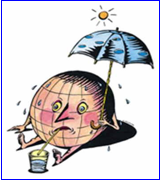 Our World is Really Warming – this despite the naysayers who keep blowin’ in the wind. Ten measurable, global features all provide evidence that Earth’s climate has warmed during the past half-century, according to a report released last week by the National Oceanic & Atmospheric Administration (Bull. Amer. Meteor. Soc. 2010, 6, S1). Seven indicators showed an uptick: air temperature over land, sea-surface temperature, air temperature over oceans, sea level, ocean heat, humidity, and temperature of the troposphere, which is the lowest layer of the atmosphere. And three indicators declined: the extent of Arctic sea ice, the mass of glaciers, and spring snow cover in the Northern Hemisphere. “These independently produced lines of evidence all point to the same conclusion: Our planet is warming,” explains NOAA Administrator Jane Lubchenco. NOAA’s “State of the Climate” Report for 2009 is based on information from scientific institutions around the world and includes data from satellites, weather balloons, ships, and field surveys. The report was published as a special supplement to the Bulletin of the American Meteorological Society and is available at www.ncdc.noaa.gov/bams-state-of-the-climate/2009.php. …continues to trend as it has, cause is irrelevant, man, Gaia or G-d, we can become victims or do something about it. ExxonMobil and Synthetic Genomics Inc. (SGI) opened a greenhouse in La Jolla, Calif., last week to begin testing methods to produce affordable biofuel feedstocks from algae. The two companies became partners a year ago when Exxon agreed to invest $600 million over the next decade in R&D at SGI and in its own labs. Algae are considered a promising biofuel starting point because they are fast-growing and can be raised on non-arable land. Various companies, from biotech start-ups to Dow Chemical, are pursuing algae-derived biofuels, but the Exxon-SGI alliance is by far the most financially ambitious. Moving out of the lab into real sunlight is “a small, but important, step,” SGI CEO J. Craig Venter said at a press conference. Although the partners are not yet using a real-world environment, they will begin assessing natural and engineered strains of algae in systems that range from open ponds to closed photo-bioreactors. They plan to evaluate and optimize growth conditions, oil production, harvesting, and recovery. They hope to find or design a strain of algae that can secrete the desired long-chain hydrocarbons. “The greenhouse will enable us to go into the next phase of our development plan, which will include a larger test facility outside,” said F. Emil Jacobs, ExxonMobil’s vice president for research. Scaling up into that facility is expected in mid-2011. So far, the algal products look similar to intermediate streams processed in existing refineries, Jacobs pointed out. Both he and Venter emphasized that the project is long-term and that it will take billions of dollars to reach commercial scale. “We are committed to this activity and will spend money necessary to be successful,” Jacobs remarked. 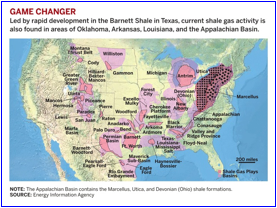 Doc says, net to resuming offshore drilling, obtain large amounts of natural gas, trapped in US shale deposits is the next big energy brouhaha. What is see is folks getting polarized and hot under the collar, rather than working together t find cost effective solutions to any negative potential environmental impacts for such drilling. After-all oil the burning natural gas for transportation fuel and electricity generation creates less carbon dioxide when burned, in shale based gas is a made in America product. It’s sure has heck easier to move natural gas, and were done with the radioactive, unregulated slag piles that surround our coal powered electrical facilities. — I have only accepted a few ‘semi-random sections of this excellent multi-page article, to wet your appetites. The reason I am sharing this particular article, among the many I’ve googled, is that it ha , despite appearing an a chemistry profession oriented magazine, is even handed about both the hopes and the fears of producing shale stored natural gas by hydrofracturing. The U.S. has a plentiful supply of natural gas—a clean-burning, efficient fuel that could help solve the nation’s energy problems, ranging from climate change to dependence on foreign oil, industry proponents contend. But critics say this view is overly optimistic, because the technology for releasing gas embedded deep underground in massive shale fields has not yet been shown to be economical. Such technology could also contaminate water supplies with toxic drilling chemicals. Geologists have long known that natural gas is abundant in shale rock formations running from the Appalachian Basin to the Rocky Mountains. But the resource has remained largely untapped because of the difficulty in extracting it. In recent years, however, advances in a technology developed decades ago by the petroleum industry to boost production at aging oil wells has helped unlock vast reserves of once-inaccessible natural gas. Hydraulic fracturing is a process in which millions of gallons of chemically treated water and sand are pumped into the ground at extremely high pressure to generate fractures or cracks in shale rocks and release trapped gas. Recoverable U.S. gas reserves might now exceed the proven reserves of Russia, the world’s largest natural gas producer, some experts say. In 2009, the Potential Gas Committee, a panel of U.S. industry specialists, found that the nation’s estimated gas reserves had surged 35% since an assessment in 2007. The jump was the largest increase in the 44-year history of reports from the committee. The U.S. now has about 2,074 trillion cu ft of technically recoverable natural gas resources—enough to meet domestic demand for more than a century at the current rate of consumption. “New and advanced exploration, well drilling, and completion technologies are allowing us increasingly better access to domestic gas resources—especially unconventional gas—which, not all that long ago, were considered impractical or uneconomical to pursue,” says John B. Curtis, a professor of geology and geological engineering at Colorado School of Mines. Natural gas is the fuel of choice for a wide range of industries, including chemical manufacturing. In addition to its use in generating electricity, natural gas is also a feedstock for a variety of products, including petrochemicals, plastics, and fertilizers. Environmental Concerns and Initial Assessment Actions — Although hydraulic fracturing has the potential to turn gas deposits in shale formations into an energy bonanza, the method is coming under increasing scrutiny. Environmental activists and some lawmakers are concerned that the drilling technique may pose a threat to drinking water. Consequently, they argue, the federal government should regulate the drilling practice. Individual states currently monitor fracturing activities. In an attempt to determine whether federal regulation of hydraulic fracturing is warranted, House Energy & Commerce Committee Chairman Henry A. Waxman (D-CA) has asked eight oil-field service companies to provide detailed information about the chemicals used in their drilling operations. These will be evaluated to determine their toxicological properties, relative to ground water protection. The Environmental Protection Agency also intends to conduct a comprehensive research study of the effects of fracturing on water quality and public health. A committee of EPA’s Science Advisory Board is expected to recommend a strategy for conducting the $1.9 million study by this summer. Agency officials have said they intend to have their initial research results completed by the end of 2012. EPA reviewed various past studies on fracturing in 2004 and concluded that the technology poses “little or no threat” to drinking water. Environmentalists dismissed the finding, claiming it was politically motivated and scientifically unsound. Poor bewildered Doc! I can’t understand why, according to the referenced link, the environmentalist bashed the 2004 studies but are pleased to have EPA expand and update it? This equation embodies the use of solar energy to rip apart water molecules to produce hydrogen, which can be used as an energy-rich fuel for vehicles and to produce electricity. If perfected and made affordable, the technology could supply a substantial portion of future global energy demand, which is anticipated to double between now and 2050. Key to solar water splitting is developing inexpensive catalysts to capture light efficiently and speed the process while minimizing the amount of electricity needed to drive the electrochemistry. Most catalysts so far have less than stellar efficiencies, rely on expensive and rare metals, or tend to be easily deactivated under harsh working conditions. Two U.S. research groups have recently reported breakthrough developments that could signal a new wave of progress in producing H2 via solar water splitting. Daniel G. Nocera and coworkers at Massachusetts Institute of Technology have made a heterogeneous cobalt phosphate water-oxidation catalyst <chemical stuff> with improved stability. And Craig L. Hill of Emory University and coworkers have created a related homogeneous cobalt catalyst supported by bulky polytungstate ligands <more great chemical stuff> that displays improved catalytic activity. Both catalysts are made from Earth-abundant elements, avoid organic ligands that are prone to oxidation during electrolysis, have a built-in mechanism for self-repair to improve lifetime, and operate at neutral pH with modest electricity input. 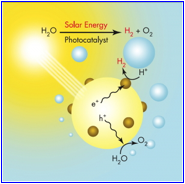 Development of such cobalt water-oxidation catalysts do benefit from federal initiatives to harness solar power to make hydrogen fuel. If perfected and made affordable, the technology could supply a substantial portion of future global energy demand, which is anticipated to double between now and 2050. Key to solar water splitting is developing inexpensive catalysts to capture light efficiently and speed the process while minimizing the amount of electricity needed to drive the electrochemistry. Most catalysts so far have less than stellar efficiencies, rely on expensive and rare metals, or tend to be easily deactivated under harsh working conditions. A company, which Nocera started last year to develop inexpensive solar-powered water-splitting systems <E.g., Direct sunlight to electricity via hydrogen as fuel to make H2 for a fuel cell that generates electricity. His company has garnered more than $4 million in ARPA-E funds. “ARPA-E is having an incredible impact on other small companies, enabling us to follow our dreams to turn science into technology and eventually into commercial products,” In a full, but not totally energy conserving cycle, In fuel cells, which also require catalysts, the opposite reactions take place to release the energy stored in the H–H bonds: hydrogen and oxygen are fed into a fuel cell, releasing electrons to make electricity and producing water. Water splitting is a two-stage process. In an electrolysis cell, water is oxidized at the positive electrode, or anode, to form oxygen, along with four hydrogen ions and four electrons. The hydrogen ions migrate to the negative electrode, or cathode, where two hydrogen ions [H+] are reduced by two electrons arriving through an external circuit to form hydrogen gas. Of the two electrode processes, both of which require a catalyst to be efficient, the water-oxidation reaction is more complex and thermodynamically demanding. There’s lots more… if what I shared is not enough check both “fuel cells” and Water Splitting in Wikipedia or just Google the terms. You’d be amazed! Not much of this has approached cost effective commercialization, but methinks were getting close. One interesting sidelight — Fuels produce direct current, not the usual AC current in our walls; this is the type of electricity that Edison was promoting in days gone by. I found this article while browsing a recent C&EN issue and decided to share it because it pushed a button in my mind. Almost of the ways of dealing with the excess carbon dioxide in the environment call for what is in essence throwing it away. Whether that’s by pumping into a deep geological formation, or precipitating it into the ocean bottom; even using it to enhance oil recovery for spent wells — it’s all a toss the stuff game. Albeit, Dr. Bocarsly’s science is just at the invention stage, it is one of the few approached that I’ve read that use the infamous greenhouse gas as raw material. The other alternatives are to grow trees, or other vegetation including algae to use them for creating bio fuels. Andrew Bocarsly’s lab at Princeton University looks like any photo-electrochemistry lab you might stumble into. Crumpled pieces of aluminum foil cloak light-sensitive chemical reactions. Three-necked flasks decorate the bench tops like vases sprouting electrodes instead of flowers. But it’s a chemical you can’t see that’s become a focus for the Bocarsly lab in recent years—carbon dioxide, specifically the CO2 pollution that pours out of cars and power plants each day. Two years ago, Bocarsly reported that with the help of a pyridinium catalyst he was able to use visible light to transform CO2 into methanol (J. Am. Chem. Soc. 2008, 130, 6342). The process uses a light-driven gallium phosphide semiconductor electrode to reduce carbon dioxide gas that’s bubbled through a pyridinium solution. <Okay, that more chemistry than you wanted, but keep reading anyway – this is just another hopefully great magical POfS*>. Since that time, the research has spun off in two directions: In Bocarsly’s lab at Princeton, there’s been an intensive effort to understand the mechanism behind this process and in a research park five miles north of campus, a small company called Liquid Light is trying to capitalize on it. In 2008, Kyle Teamey, Liquid Light’s chief operating officer, was working as an entrepreneur-in-residence with Redpoint Ventures. He read Bocarsly’s Journal of the American Chemical Society communication and thought the technology had promise. “With any catalytic process there are certain things you look for,” Teamey says. “You look for energy efficiency, the stability of the catalyst, the kinetics. Several factors need to come together for a catalytic process to work efficiently, particularly when you’re looking at commodity markets where products are made at large scale. We were attracted to this technology because it displayed factors that generally indicate it has potential. “Ultimately what we’d like to do is make CO2 a feedstock for producing fuels and chemicals. That’s the ultimate vision,” Teamey says. For that to happen, Bocarsly’s process needs to compete cost-wise with traditional methanol production. It’s not enough to be doing something that’s environmentally friendly by removing excess CO2 from the air. Liquid Light needs to compete financially. There’s a lot more including so me interesting chemistry for those like me who are so inclined. Also note that POfS is a pinch of stuff. With world population climbing, and energy demand along with it, countries are trying to figure out how to minimize the global-warming consequences of carbon-based energy. The challenges are enormous: Because of differences in energy resources, nations around the world have different abilities to shift away from fossil fuel and to adapt technologies that reduce CO2 emissions. And many of those technologies are not moving as fast as they could be because of uncertainty in public policies to reduce CO2 emissions. These are the take-home messages from a conference held to stimulate ideas and form collaborations to quicken the pace of development and implementation of CO2-emissions-reducing technologies. To “reduce” CO2, countries can cut emissions by improving the efficiency of vehicles, electricity generation, and industrial processing, he said. To “reject” CO2, countries can develop ways to burn coal cleanly and use technologies to capture and store CO2 to keep the greenhouse gas out of Earth’s atmosphere. And to “dilute” CO2, countries can reduce their use of fossil fuel and increase use of carbon-neutral biofuels and alternative sources of energy such as solar and wind. Doc sez, I can’t figure out how to get any more than two of three of these goals optimized simultaneously – something has to give. This sounds too much like ‘a free lunch’. On top of that there have to be customers willing to pay for what you produce. 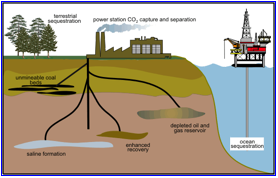 Globally, three sequestration technologies are actively being developed: storage in saline aquifers in sandstone formations, where the CO2 is expected to mineralize into carbonates over time; injection into deep, uneconomic coal seams; and injection into depleted or low-producing oil and natural gas reservoirs. Overall, billions of tons of CO2 must be captured and stored per year to stabilize atmospheric CO2 at levels that should moderate global warming. Global capacity for sequestration is pegged at hundreds of billions of tons of CO2, adequate for several hundred years of storage. Currently, only tens of millions of tons of CO2—most of it from natural gas and not coal-fired power plants—are being squirreled away by demonstration storage projects and oil and natural gas mining operations. Like most of the attendees at a recent CO2 summit, DOE’s Richards believes many different energy technologies, from coal to solar, will be integral parts of the future energy mix. It’s not possible to know politically or economically which ones will play leading roles. “Predicting the future is easy, but predicting it correctly is more difficult,” he quipped. “I can say with confidence that we need more energy, and we want to manage the CO2 emissions. There’s lot more about the international perspectives on how to control and dispose CO2. However, most technical experts continue believe “If we continue business as usual, we can’t imagine how CO2 emissions are going to impact the planet. By Stephen K. Ritter, Chemical & Engineering News, July 26, 2010. The fate of spilled oil in the Gulf rests with the hydrocarbon-digesting microbes colonizing underwater plumes. Millions of gallons of oil now drift throughout the Gulf of Mexico in massive, underwater plumes. Last week, scientists from the University of South Florida confirmed that this submerged oil came from BP’s leaking well more than 5,000 feet below the ocean’s surface. Over the past three months, the high pressure at the wellhead has pulverized the oil, while chemical dispersants have broken it into microscopic droplets. Unlike surface oil slicks, which physical forces such as evaporation can degrade, the fate of these hovering oil clouds—and by extension the Gulf’s ecological future—lies chiefly with a biological process: the conversion of hydrocarbons into less harmful byproducts by marine bacteria. After an April 20 explosion sank the Deepwater Horizon exploration rig and started the largest oil spill in U.S. history, microbiologists have converged on the Gulf to investigate the microbial composition throughout its waters and affected coastlines. According to Joel Kostka, a microbial ecologist at Florida State University, Tallahassee, the fundamental goals of this research are to determine the oil’s impact on the Gulf’s microbial ecosystems and to assess how limiting factors, chiefly oxygen concentrations, influence microbial oil degradation. Results could supply insights not only into the Gulf’s ongoing recovery, Kostka says, but also into how scientists might direct cleanup operations more efficiently. Preliminary data collected by these researchers show that marine microbes have mobilized across the Gulf and are in fact chewing their way through the oil plumes. These monitoring efforts have chiefly focused on drops in dissolved oxygen levels, a sign of microbial metabolism. Graduate students working with Andreas Teske, a marine biologist at the University of North Carolina, Chapel Hill, collected water samples from May 26 to June 8 aboard the University of Miami’s research vessel (RV) Walton Smith. They found that alkane hydrocarbon -digesting bacteria have colonized the Deepwater Horizon oil plumes and have begun to consume significant amounts of dissolved oxygen. Likewise, David Valentine, a microbial geochemist at the University of California, Santa Barbara, has observed microbe-associated oxygen declines in plumes of oil and methane gas. In these “gassy” plumes located within a 5- to 7-mile radius of the wellhead and at depths greater than 2,500 feet, oxygen levels drop by between 5 and 35%, he says. Valentine gathered his samples from June 11 to June 20, while aboard the RV Cape Hatteras, operated by the Duke/University of North Carolina Oceanographic Consortium. Also in a July 23 report, the US government’s Joint Analysis Group described dissolved oxygen drops at depths below 1,000 meters near the wellhead, where BP crews have injected dispersants directly into the leaking oil. But scientists don’t exactly know yet which bacteria species are present in these plumes. The Gulf has a “leaky” seafloor, populated with natural seeps that discharge between 560,000 to 1.4 million bbl of crude oil ever year, according to a 2003 National Research Council report on oil spills. Also hydrocarbons in general are ubiquitous in the ocean and can be found not only in seeping oil, but also in plant waxes and lobster shells. Myriad marine bacteria have evolved to consume these hydrocarbons, and now the spill has allowed them to travel beyond their natural food sources. Doc sez, like all solutions, natural or man-made, there’s a bit of Yang with every Ying. The bacterial action may reduce spilled oil toxicity and other damage, but we don’t know how server the oxygen depletion effects will be on the marine ecosystem. Guys and Gals – this is nature. Not man-caused in action so we need to watch the wheel turning to intercede, if we can, should things go badly awry. By Charles Schmidt, Chemical & Engineering News, August 2, 2010. I’d like to close this column with a copy of an article called The Gambler sent to me by my colleague John Droz, jr. — A physicist & environmental advocate. When we are confronted with questions of science we often have neither the resources nor intellectual rigor to properly do our homework. In our ignorance, we have a habit of bestowing quasi-mystical properties on our own creations in much the same way as the faithful can be moved and inspired by splendid architecture or pious icons. Our instincts suggest that this level of expenditure, the moral correctness of the enterprise, and the weight of our investments in hope and good intentions, must surely prove the underlying theory. It stands to reason that we wouldn’t have gone so far down this path if the technology didn’t work. We take it as a given that somebody — our scientists, our politicians, our priests, or our parents — has done the intellectual heavy lifting already. Alas, this is seldom the case, and definitely not so here. In the disciplines of politics and parenting, expedience is quite often the order of the day, and obfuscation, misdirection and white lies are the tools of implementation. In a world currently focused on all things green it is perceived to be politically irresponsible to be circumspect or behind the curve. “We have to do something, or every little bits helps” have now become the mantra. The “something” our representatives are endorsing is for us to pay exorbitant premiums to people who have no more background in power production than does the local school marm. We are asked to line the developer’s seemingly limitless pockets with unrequited subsidies and incentives — despite the fact that green energy solutions on the production side of the equation have been shown, the world over, to be window dressing, canards and delusions. In so doing we will divert resources, time and attention away from more meaningful solutions, and from programs like conservation and reuse — options and programs that we know reduce our impact on the environment. Instead, we will expend greater resources, build bigger more impressive monuments and blindly put our faith in the promises of others — despite all the empirical science to the contrary. We will convince ourselves that our good intentions plus the size and scope of the effort is evidence enough of its merit. We are being seduced by the splendor of the temple without taking the time to see the emptiness of the catechism. Frankly, I’d rather just pray. It costs less, holds equal promise, and is not a blight on the landscape. Copyright Notice: Product and company names and logos in this review may be registered trademarks of their respective companies. Some of the articles listed in this column are copyright protected – their use is both acknowledge and is limited to educational related purposes, which this column provides. In addition, when duplicating materials that I cite, I do not fill the material with quotation makes, the only place I keep quotes intact is where the original article ‘quotes’ another source. Remember, when Doc sticks his two bits in, its in italics, usually indented. Remember, conditions, both technical and geopolitical continuously change – So if you’ve made up your mind about either the best way to go, or about its all a conspiracy, move on to the next article in our blog. Today’s favorite is tomorrow unintended consequences. However, that’s better than sticking one’s head in the sand or believing in perpetual motion. Remember, there’s no free lunch and as a taxpayer and consumer you shall always end up paying the piper! Readers Again Please Take Note — Many of the technologies I share still have to prove that they are reliable, durable, scalable and cost effective. They also have to demonstrate that we will not fall victim top the law of unintended consequences when we implement them. If you care to Google them in detail, you will find studies saying they are capable of being commercialized and often as many studies that whose authors remain skeptical. Putting ones money where one mouth is creates one method of determining the reality of a dream still to come true. Ask any one with a technical start-up company – the big cost is the leap from bench scale to operational facility. Sometime not that is a good test – look at the ethanol plants that have shut down in the mid-west. May your world get greener and all creatures on Earth become healthier and more able to fulfill their function in this Gaia’s world. July 23, 2010 – The Greening Continues: Will Electric Cars Destroy Your Neighborhood Power Grid?